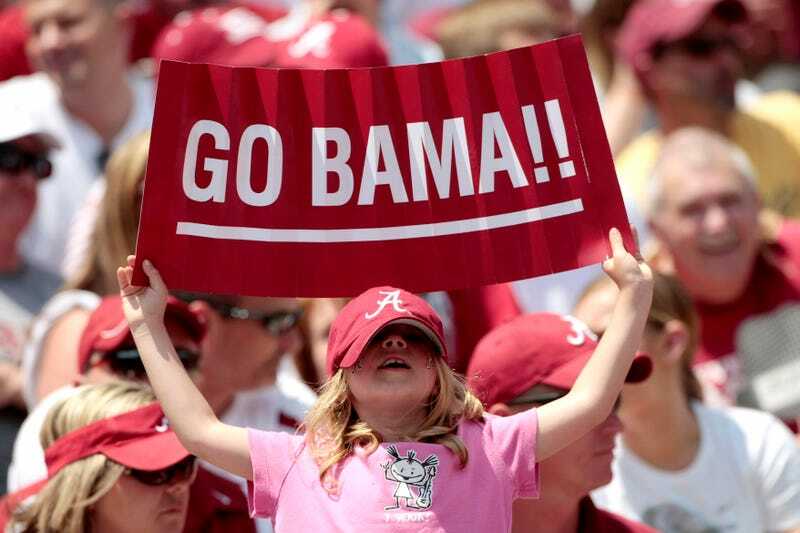 The Birmingham News reports that an Alabama civil court trial, set to begin on Jan. 7 (also and far more widely known as the day of the BCS championship game between Alabama and Notre Dame) has been postponed because one of the lawyers really, really likes Alabama football. An Alabama football fan in Alabama? No way. His attendance at the game had looked doubtful earlier today. A judge had denied his first attempt earlier this month to have the trial delayed. [Marcus] Jones has been a self-described "fanatic" of University of Alabama football since his father took him to football games in the early 1960s as a young boy. He said he still has a beer can Joe Namath drank from at a bar the night it was announced the star Alabama quarterback would be joining the Jets. "We're just die hard Alabama fans," he said of his family. So when he was finally assured that his University of Alabama football team would be going to the BCS National Championship game on Jan. 7, he bought tickets and had one major obstacle to overcome. He needed to get a civil court trial rescheduled that was set to begin the day of the game. Jones wrote in his original motion that he has long held "a strong belief that football in Alabama is special" and waited so long to ask for a continuance "due to superstition and the uncertainty of how the season would play out." The craziest part (besides the Joe Namath beer can thing): The judge, who has delayed trials twice before for Auburn and Alabama fan-lawyers, originally denied the motion because he thought the case would settle—early and irrespective of its natural progression—if he kept the start on Jan. 7. He thought a professional lawyer would hasten to settle regardless of the potential damage to his client if the case threatened to make it impossible for the lawyer to attend a football game. He didn't—but the judge thought the odds were good! The same judge granted a continuance to an Auburn fan-lawyer in 2010 by reading out an order set to The Night Before Christmas, because, sure. If you ever sue anyone in Alabama, remember not to schedule your day in court when there's something happening related to college football, which, in Alabama, is always. Update: Reader Mike—proud ND alum!—points out that a judge in South Bend did essentially the same thing, with an equally loony justification. College football: Creating holes in court dockets beyond just the SEC.